These are a great set of sheets. I had them shipped to my daughter in another city and she absolutely loves them. We ordered the white (the only color she likes for sheets) and they beyond meet her expectations. She has laundered them a couple of times with no pilling or shrinking. Treat yourself to luxurious comfort each night when you slip into the embrace of these silky sheets. 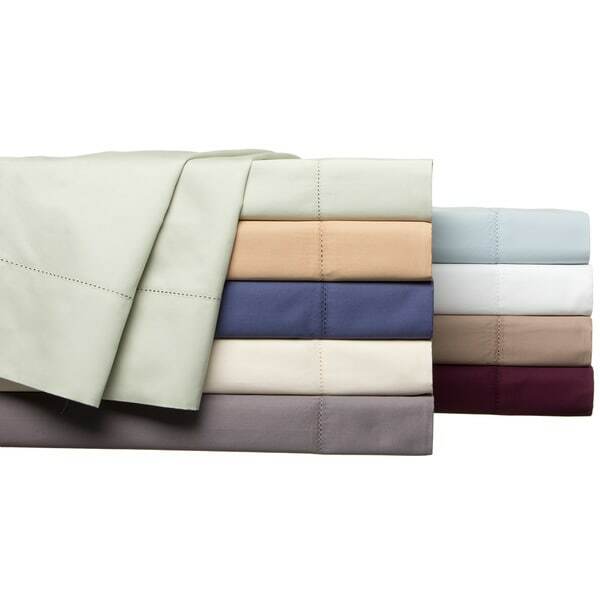 Made of 100-percent cotton with a soft, durable 500 thread count and a subtly shiny sateen weave, you'll be impressed with the quality and value of this sheet set. Bad reviews can scare you away and there are so many variations on all these different types of sheet sets offered on overstock that I just had to take the plunge and pick one (well I order a 350 count one too). I'm a 30 something bachelor so I'm not too versed. I just know good comfort and to have nice sheets (thanks Mom). I ordered the grey cali-king set. My bed is a cali-king and is probably is 15+ inches deep. The sheets come in the typical plastic zipper package. The front tag reads "Andiamo Fine Linens, Ispirato en Italia per la casa, 500 thread count, 100% Egyptian Cotton - Single ply yarn, 15" Deep pockets fits mattresses up to 17" The back does read "Made in India" and "...500 threads per square inch" With that said, I tried the sheet over my bed first to check the fit and was happy to see elastic all around and that it fit. I then immediately washed the sheets following the instructions. Although I missed the gentle cycle but will do that moving forward. There was very little lint in the lint screen before and looked no different after. The sheet has a nice sheen that remained after washing. Use some type of fabric softner. I think a few of these complainers don't know how to wash clothes. And bathe your skin before hitting the nice clean sheets. Makes no sense hopping in the bed on clean sheets with your skin from a day of activities. After drying on low heat, you will definitely have to iron the wrinkles out if you're a stickler for that. I'm not. I just wanted to go to bed. The sheets are soft people!...and comfortable. I usually am up late but I was knocked out by 930p and missed the rest of MNF after getting in these sheets. They are not thin and not thick. Just right for me, because I am typically warm. I can probably just sleep in them without a comforter even into the winter months for a little while. No pilling ocurred so far. These are good sheets. Maybe it's helped by my pretty awesome bed and vice versa. You have to take a chance somewhere though. Glad I did. I recommend! This product is not what is advertised. The ad says 100% Egyptian Cotton that is "calendared and mercerized." The sheets are made in India with long staple cotton that is calendared, not mercerized. Egyptian cotton is just one type of long staple cotton. If these sheets truly were made of Egyptian cotton the package would reflect that. Also, the calendaring process is inferior to mercerizing. These are not bad sheets, they are just not what is advertised. Buyer beware. Very soft and fit beautifully over 4 inch mattress topper. The sheets fit my 10 inch deep mattress perfectly and they are wonderfully soft, but the pillowcases need to be ironed. GREAT sheets for a Great Price! I love the softness and the all around elastic makes is easy to put on a deep mattress, which we have.....needed at least 18 inches and these were perfect with a pillow top mattress pad as well as a 4 inch foam padding! Need more of these in more colors! These sheets fit my king mattress with a 4 inch memory foam topper very well. They are soft and comfortable to sleep on and have held up well through washing. I loved the sheets the first week i received them-very soft and the hem stitch looked grand, but after the first two washes, I could not use these sheets anymore. The pilling was horrible and the sheets had shrunk by a huge amount, I could not fit them on our mattress anymore. sorely disappointed as I loved the colors and felt this was such a good buy initially. Color was perfect, high quality feel, was glad to finally get a fitted sheet that fits over a 3 inch mattress topper. Great value and they fit the tempurpedic 8 inch "Deluxe" mattress. More importantly, my wife loves them. These are great sheets - feel great, very soft. I liked them so much, I ordered another set right after I tried the first set. The only thing I was surprised about was that the stitching is coming undone on the 2nd set on the one side of the fitted sheet after the first washing. I can mend this pretty easily, but am concerned about more issues with the stitching coming undone in the future. We ordered the white sheets and so far we have been pleased with our purchase. The quality of these sheets is excellent. We have washed them and they have retained their softness, form and size. I can't really comment on the wrinkle quality, b/c it seems to me all sheets wrinkle once you dry them. The wrinkling of these seems average.What I personally look for in sheets is softness, and these are perfect. They are not stiff or scratchy. The quality is excellent for the price. We would definitely order these sheets again. In fact, I came back on Overstock to order another set, but they are currently out of stock of the white king sheets. . but as soon as they are back in stock, I will be ordering another set. We bought these sheets for our new king size bed. We received them in early August. . Right from the beginning the lower fitted sheet started to get pilly. It is now mid November and we can no longer use them. If we do it is like sleeping on sand. Because there was only a 30 day warranty period Overstock will not refund us our money. They did refund us $$$ though. These are excellent, high quality sheets. While they do wrinkle a bit, of course, because they are cotton, I think they are worth the time to iron. Then when you get in bed it feels like when you stay at a luxury hotel. The worst sheets I have ever purchased. I spoke to an expert ( a woman who owned a high end store selling Anicini sheets) that told me that 100% Egyptian cotton with a thread count of 500 is the way to go....but after one washing; the sheets have pilled. They pick up every particle i.e. hair; lint, etc and it sticks. They are so soft, they have no shape and bunch up, even at the top when you fold over the sheet. They have the texture of flannel sheets so with Egyptian cotton sateen finish and a high thread count, this seems completely out of wack. I don't buy sheets often; so when I do; I look for the best that money can buy. I am now convinced the only way to buy is to go with a reputable brand. Yes, they were inexpensive but by the description I should expect them to be good sheets. I made my husband take back expensive sheets from *** to buy these sheets. I f I could, I would return these sheets and invest in something that is truly luxury. We had these sheets on just a few months (I wash my sheets weekly), & although I liked their biillowy, light feel; my husband cursed all the nits that started popping up. Yes, many, many nits. I was really disappointed with these sheets. Crisp and durable. The elastic has held over numerous washings, would recommend. Queen size is a little tight but nice fabric and true color. These sheets are everything the ad says ! We love the softness and smoothness of the sheets, and they fit very nicely on the mattresses. The color is true to the picture, and is a lovely shade of green. Material is definitely 500 thread count, and the price is excellent ! Soft sheet set that I bought for my son's bed - highly recommend. These are really nice sheets. Soft to the touch, smooth great quality cotton. I ordered the queen set, the deep pockets are accurate. I have a mattress topper and still have more than enough room to fit around the entire mattress with ease, not pulling from one side or the other. Nice set, held up well. After trying the 1200 count set we prefer the higher thread count. Softest sheets! They fit very well and definitely have deep pockets. They aren't too hot and my kids seem to like them a lot. Have washed them several times and they are holding up just fine. "Does anyone own the Gold set. It's hard to tell what shade of gold it is. Is it subtle or on the darker side." Hello ddanielsen, we can appreciate the fact you want a firsthand account of the product. You will receive an email notification every time you get a response. Thank you for shopping with us. "Which blue is which? I'm wanting to buy the darker blue. Is that blue haze?" Hello Molinari, the darker blue would be the pacific blue. Please let us know if you have any further questions. "Is the fitted sheet elastic all the way around.?" Hello Julzz, yes one reviewer said the elastic goes all the way around the fitted sheet. Have a great day! I chose this because it was Egyptian cotton and the mattress fit. "Where are these sheets made." Thank you for contacting us kbelfa. These are made in India. Please let us know if you have any further questions. "Is the cotton long staple?" Thank you for your question gatorjd14. Yes, the Andiamo Solid 500 Thread Count Egyptian Cotton Sheet Set is long staple. Have a great day. What??? Long staple? All I can say is great set of sheets for the price. Durable and comfortable. Own 3 sets now including KIng and QUeen pillow cases. Absolutely a great investment. "will the fitted sheet fit a deep size mattress?"